So i have a problem with DLNA "Play On" feature. It's not working anymore in 3.6.x.x beta releases. I have over past months tried many different beta versions and nothing has changed. Everything works fine with 3.5.x.x versions. 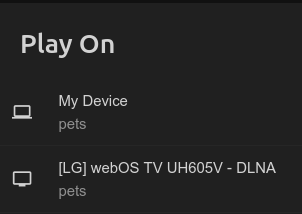 My TV will not even appear in the "Play On" list in the 3.6.x.x versions. emby runs in a FreeNAS 11.2 RC2 iocage jail. TV is a LG webos 3.5 smart tv. System.NotImplementedException: System.NotImplementedException: The method or operation is not implemented. Hi, would you mind telling me your exact iocage start command and a little bit about your network infrastructure? The network is very simple. Everything is in one /24 subnet. 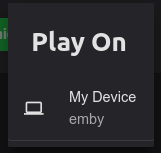 No restriction between the tv and emby server. I don't know if you changed anything regading my issue in 3.6.0.76 but i just installed a new jail with the latest beta and the tv now properly appears in the "Play On" list. I did the preliminary test remotely. will do some more testing when i get home. So i did some more testing last night and everything works as expected again.